The content: Books, rare artefacts, sculptures, etc. and the technology: the project would be synergetic, in the sense the we would develop the technology around engaging content. The interactive Virtual Reality (VR) prototype visualized The Long Room content and history where a user would be immersed in a world through VR simulation. The user could be located anywhere in the world, and by putting on the Head Mounted Display (HMD), they can enter the magical virtual simulation of the Long Room. The user can explore this on PC (browser), iPad, iPhone or Android Phone/Tablet. 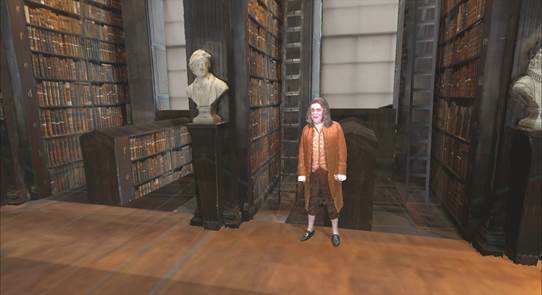 The Augmented Reality (AR) version takes place within the actual Library environment via the use of HoloLens or handheld was developed in the second phase and only uses Dynamic content and did not ‘virtually’ reconstruct the internal spaces of the Long Room. This project is an example of our creative experiments, which showcase our original technologies in real creative productions. In this case we demonstrate our novel tools and pipeline for AR/VR content creation.